You can fail back to a VM in the original location on the source host. You can fail back to a VM that has been restored up-front from the backup in a new location. You can fail back to an entirely new location by transferring all VM replica files to the selected destination. The first two options help you decrease recovery time and use of the network traffic: Veeam Backup & Replication needs to transfer only differences between the original VM and VM replica. The third option can be used if there is no way to use the original VM or restore the VM from the backup before performing failback. If the original VM is running, Veeam Backup & Replication powers it off. Veeam Backup & Replication calculates the difference between disks of the original VM and disks of the VM replica in the Failover state. 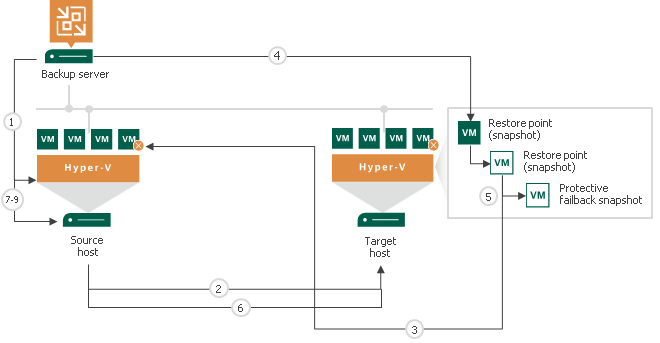 Difference calculation helps Veeam Backup & Replication understand what data needs to be transported to the original VM to synchronize it with the VM replica. Veeam Backup & Replication transports changed data to the original VM. Veeam Backup & Replication powers off the VM replica. The VM replica remains powered off until you commit failback or undo failback. Veeam Backup & Replication creates a failback protective snapshot for the VM replica. The snapshot acts as a new restore point and saves the pre-failback state of the VM replica. You can use this snapshot to return to the pre-failback state of the VM replica afterwards. Veeam Backup & Replication calculates the difference between the VM replica and the original VM once again and transports changed data to the original VM. A new synchronization cycle lets Veeam Backup & Replication copy a portion of last-minute changes made on the VM replica while the failback process was being performed. The state of the VM replica is changed from Failover to Failback. Veeam Backup & Replication temporarily puts replication activities for the original VM on hold. If you have selected to power on the original VM after failback, Veeam Backup & Replication powers on the restored original VM on the target host. Veeam Backup & Replication transports all VM replica files and stores them on the target volume. Veeam Backup & Replication registers a new VM on the target host. In Veeam Backup & Replication, failback is considered a temporary stage that should be further finalized. After you test the recovered original VM and make sure it is working without problems, you should commit failback. You can also undo failback and return the VM replica back to the Failover state.